Order within 34 hours and 2 minutes to receive your order by Tuesday 23rd April. That every day pendant needs to be something which can be worn with ease, matches every look and flatters the neckline. This is nothing short of the perfect pendant, and one which is a must have for the jewellery collection. 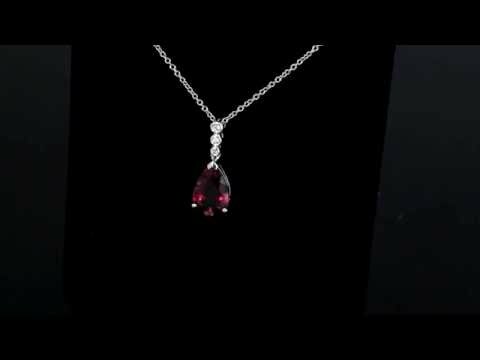 This gorgeous diamond & pink tourmaline pendant has been gorgeously crafted out of 18 carat white gold which includes a 16 inch chain. The chain of the pendant works seamlessly towards 3 diamonds in a linear collet setting which sparkle seamlessly with their G/H colour. From this the pear cut tourmaline is held delicately in a three claw setting which allows the vivid red colour of the gem to be on show. If you should have any further questions regarding this diamond & pink tourmaline pendant then please do not hesitate to contact us.